For the song by The Game, see Camera Phone (song). Camera phones allow instant, automatic photo sharing. There is no need for a cable or removable card to connect to a desktop or laptop to transfer photos. Most camera phones are simpler than separate digital cameras. Their usual fixed-focus lenses and smaller sensors limit their performance in poor lighting. Lacking a physical shutter, some have a long shutter lag. Photoflash is typically provided by an LED source which illuminates less intensely over a much longer exposure time than a bright and near-instantaneous flash strobe. Optical zoom and tripod screws are rare and none has a hot shoe for attaching an external flash. Some also lack a USB connection or a removable memory card. Most have Bluetooth and WiFi, and can make geotagged photographs. Some of the more expensive camera phones have only a few of these technical disadvantages, but with bigger image sensors (a few are up to 1"), their capabilities approach those of low-end point-and-shoot cameras. In the smartphone era, the steady sales increase of camera phones caused point-and-shoot camera sales to peak about 2010 and decline thereafter. Most model lines improve their cameras every year or two. Most modern smartphones only have a menu choice to start a camera application program and an on-screen button to activate the shutter. Some also have a separate camera button, for quickness and convenience. A few camera phones are designed to resemble separate low-end digital compact cameras in appearance and to some degree in features and picture quality, and are branded as both mobile phones and cameras. The principal advantages of camera phones are cost and compactness; indeed for a user who carries a mobile phone anyway, the addition is negligible. Smartphones that are camera phones may run mobile applications to add capabilities such as geotagging and image stitching. Also, smartphones can use their touch screens to direct their camera to focus on a particular object in the field of view, giving even an inexperienced user a degree of focus control exceeded only by seasoned photographers using manual focus. However, the touch screen, being a general purpose control, lacks the agility of a separate camera's dedicated buttons and dial(s). Nearly all camera phones use CMOS image sensors, due to largely reduced power consumption compared to CCD type cameras, which are also used, but in few camera phones. Some of camera phones even use more expensive Backside Illuminated CMOS which uses less energy than CMOS, although more expensive than CMOS and CCD. 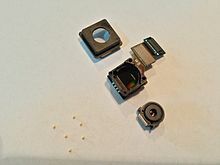 Samsung Galaxy S5 camera, including the floating element group, suspended by ceramic bearings and a small rare earth magnet. Most camera phones have a digital zoom feature. A few have optical zoom. An external camera can be added, coupled wirelessly to the phone by Wi-Fi. They are compatible with most smartphones. Phones usually store pictures and video in a directory called /DCIM in the internal memory. Some can store this media in external memory (Secure digital card or USB on the go pen drive). Camera phones can share pictures almost instantly and automatically via a sharing infrastructure integrated with the carrier network. Early developers including Philippe Kahn envisioned a technology that would enable service providers to "collect a fee every time anyone snaps a photo". The resulting technologies, Multimedia Messaging Service and Sha-Mail, were developed parallel to and in competition to open Internet-based mobile communication provided by GPRS and later 3G networks. The first commercial camera phone complete with infrastructure was the J-SH04, made by Sharp Corporation; it had an integrated CCD sensor, with the Sha-Mail (Picture-Mail in Japanese) infrastructure developed in collaboration with Kahn's LightSurf venture, and marketed from 2001 by J-Phone in Japan today owned by Softbank. The first commercial deployment in North America of camera phones was in 2004. The Sprint wireless carriers deployed over one million camera phones manufactured by Sanyo and launched by the PictureMail infrastructure (Sha-Mail in English) developed and managed by LightSurf. While early phones had Internet connectivity, working web browsers and email-programs, the phone menu offered no way of including a photo in an email or uploading it to a web site. Connecting cables or removable media that would enable the local transfer of pictures were also usually missing. Modern smartphones have almost unlimited connectivity and transfer options with photograph attachment features. During 2003 (as camera phones were gaining popularity), in Europe some phones without cameras had support for MMS and external cameras that could be connected with a small cable or directly to the data port at the base of the phone. The external cameras were comparable in quality to those fitted on regular camera phones at the time, typically offering VGA resolution. One of these examples was the Nokia Fun Camera (model number PT-3) announced together with the Nokia 3100 in June 2003. The idea was for it to be used on devices without a built-in camera (connected via the Pop-Port interface) and be able to transfer images taken on the camera (VGA resolution and a flash) directly to the phone to be stored or sent via MMS. Sony SmartShot QX series, announced and released in mid 2013. They include the DSC-QX100/B, the large Sony ILCE-QX1, and the small Sony DSC-QX30. External cameras for thermal imaging also became available in late 2014. The Nokia N8 smartphone is the first Nokia smartphone with a 12-megapixel autofocus lens, and is one of the few camera phones (the first was Nokia N82) to feature Carl Zeiss optics with xenon flash. The camera phone, like many complex systems, is the result of converging and enabling technologies. There are dozens of relevant patents dating back as far as 1956. Compared to digital cameras, a consumer-viable camera in a mobile phone would require far less power and a higher level of camera electronics integration to permit the miniaturization. The CMOS active pixel sensor "camera-on-a-chip" developed by Eric Fossum and his team in the early 1990s achieved the first step of realizing the modern camera phone as described in a March 1995 Business Week article. While the first camera phones (e.g. J-SH04), as successfully marketed by J-Phone in Japan, used charge-coupled device (CCD) sensors and not CMOS sensors, more than 90% of camera phones sold today[when?] use CMOS image sensor technology. Over the years there have been several videophones and cameras that have included communication capability. Some devices experimented with integration of the device to communicate wirelessly with Internet, which would allow instant media sharing with anyone anywhere. The DELTIS VC-1100 by Japanese company Olympus was the world's first digital camera with cellular phone transmission capability, revealed in the early 1990s and released in 1994. In 1995, Apple experimented with the Apple Videophone/PDA. There was also a digital camera with cellular phone designed by Shosaku Kawashima of Canon in Japan in May 1997. In Japan, two competing projects were run by Sharp and Kyocera in 1997. Both had cell phones with integrated cameras. However, the Kyocera system was designed as a peer-to-peer video-phone as opposed to the Sharp project which was initially focused on sharing instant pictures. That was made possible when the Sharp devices was coupled to the Sha-mail infrastructure designed in collaboration with American technologist Kahn. The Kyocera team was led by Kazumi Saburi. In 1995, work by James Greenwold of Bureau Of Technical Services, in Chippewa Falls, Wisconsin, was developing a pocket video camera for surveillance purposes. By 1999, the Tardis recorder was in prototype and being used by the government. Bureau Of Technical Services advanced further by the patent No. 6,845,215,B1 on "Body-Carryable, digital Storage medium, Audio/Video recording Assembly". A camera phone was patented by Kenneth Parulski and James Schueckler, two engineers at Kodak, in 1995. Their patent application was filed with the US Patent and Trademark Office (USPTO) on April 24, 1995. The patent application specifically described the combination as either a separate digital camera connected to a cell phone or as an integrated system with both sub-systems combined together in a single unit. Their patent application design included all of the basic functions camera phones implemented for many years: the capture, storage, selection, and display of digital images and the means to transmit the images over the cellular telephone network to any number of receivers via stored numbers or keyboard input. Upon receipt of the patent application the USPTO published the complete application in both a monthly printed volume of new patent applications and on the USPTO web site as they do for all patent applications. Publishing the full disclosure of the diagrams and text of the patent application allowed any other party to file a claim of pre-existence. Publishing of all the details also enabled the concept and technology to spread; any other person or company could understand the technology so they could either license the patent from Kodak or extend the concept (e.g. rear-facing camera). On September 9, 1997, the USPTO granted US Patent 5,666,159 to Parulski and Schueckler. This patent is cited by 207 later patents as the invention of the camera phone. On June 11, 1997, Philippe Kahn instantly shared the first pictures from the maternity ward where his daughter Sophie was born. He wirelessly transmitted his cell phone pictures to more than 2,000 family, friends and associates around the world. Kahn's wireless sharing software and camera integrated into his cell phone augured the birth of instant visual communications. Kahn's cell phone transmission is the first known publicly shared picture via a cell phone. Cameras on cell phones proved popular right from the start, as indicated by the J-Phone in Japan having had more than half of its subscribers using cell phone cameras in two years. The world soon followed. In 2003, more camera phones were sold worldwide than stand-alone digital cameras largely due to growth in Japan and Korea. In 2005, Nokia became the world's most sold digital camera brand. In 2006, half of the world's mobile phones had a built-in camera. In 2006, Thuraya released the first satellite phone with an integrated camera. The Thuraya SG-2520 was manufactured by Korean company APSI and ran Windows CE. In 2008, Nokia sold more camera phones than Kodak sold film-based simple cameras, thus becoming the biggest manufacturer of any kind of camera. In 2010, the worldwide number of camera phones totaled more than a billion. Since 2010, most mobile phones, even cheapest ones, are being sold with a camera. High-end camera phones usually had a relatively good lens and high resolution. Higher resolution camera phones started to appear in 2010s. 12-megapixel camera phones have been produced by at least two companies. To highlight the capabilities of the Nokia N8 (Big CMOS Sensor) camera, Nokia created a short film, The Commuter, in October 2010. The seven-minute film was shot entirely on the phone's 720p camera. A 14-megapixel smartphone with 3× optical zoom was announced in late 2010. In 2012, Nokia announced Nokia 808 PureView. It features a 41-megapixel 1/1.2-inch sensor and a high-resolution f/2.4 Zeiss all-aspherical one-group lens. It also features Nokia's PureView Pro technology, a pixel oversampling technique that reduces an image taken at full resolution into a lower resolution picture, thus achieving higher definition and light sensitivity, and enables lossless zoom. In mid-2013, Nokia announced the Nokia Lumia 1020. In Late 2017, Apple introduced the iPhone 7 Plus, one of the phones to popularize a dual camera setup. The iPhone 7 Plus included a main 12 MP camera along with a 12 MP telephoto camera which allowed for 2x optical zoom and Portrait Mode for the first time in a smartphone. In early 2018 Huawei released a new flagship phone, the Huawei P20 Pro, with one of the first triple camera lens setup. Making up its three sensors (co-engineered with Leica) are a 40 megapixel RGB lens, a 20 megapixel monochrome lens, and a 8 megapixel telephoto lens. Some features on the Huawei P20 Pro include 3x optical zoom, and 960 fps slow motion. In late 2018, Samsung released a new mid-range smartphone, the Galaxy A9 (2018) with the world's first quad camera setup. The quadruple camera setup features a primary 24MP f/1.7 sensor for normal photography, an ultra-wide 8MP f/2.4 sensor with a 120 degrees viewing angle, a telephoto 10MP f/2.4 with 2x optical zoom and a 5MP depth sensor for effects such as Bokeh. Major manufacturers of cameras for phones include Toshiba, ST Micro, Sharp, Omnivision, and Aptina (Now part of ON Semiconductor). Taking a photograph with cell phone. Personal photography allows people to capture and construct personal and group memory, maintain social relationships as well as expressing their identity. The hundreds of millions of camera phones sold every year provide the same opportunities, yet these functions are altered and allow for a different user experience. As mobile phones are constantly carried, camera phones allow for capturing moments at any time. Mobile communication also allows for immediate transmission of content (for example via Multimedia Messaging Services), which cannot be reversed or regulated. Brooke Knight observes that "the carrying of an external, non-integrated camera (like a DSLR) always changes the role of the wearer at an event, from participant to photographer". The camera phone user, on the other hand, can remain a participant in whatever moment they photograph. Photos taken on a camera phone serve to prove the physical presence of the photographer. The immediacy of sharing and the liveness that comes with it allows the photographs shared through camera phones to emphasize their indexing of the photographer. While phones have been found useful by tourists and for other common civilian purposes, as they are cheap, convenient, and portable; they have also posed controversy, as they enable secret photography. A user may pretend to be simply talking on the phone or browsing the internet, drawing no suspicion while photographing a person or place in non-public areas where photography is restricted, or perform photography against that person's wishes. At the same time, camera phones have enabled every citizen to exercise her or his freedom of speech by being able to quickly communicate to others what she or he has seen with their own eyes. In most democratic free countries, there are no restrictions against photography in public and thus camera phones enable new forms of citizen journalism, fine art photography, and recording one's life experiences for facebooking or blogging. As a network-connected device, megapixel camera phones are playing significant roles in crime prevention, journalism and business applications as well as individual uses. They can also be used for activities such as voyeurism, invasion of privacy, and copyright infringement. Because they can be used to share media almost immediately, they are a potent personal content creation tool. On January 17, 2007, New York City Mayor Michael Bloomberg announced a plan to encourage people to use their camera-phones to capture crimes happening in progress or dangerous situations and send them to emergency responders. Through the program, people will be able to send their images or video directly to 911. Camera phones have also been used to discreetly take photographs in museums, performance halls, and other places where photography is prohibited. However, as sharing can be instantaneous, even if the action is discovered, it is too late, as the image is already out of reach, unlike a photo taken by a digital camera that only stores images locally for later transfer (however, as the newer digital cameras support Wi-Fi, a photographer can perform photography with a DSLR and instantly post the photo on the internet through the mobile phone's Wi-Fi and 3G capabilities). Apart from street photographers and social documentary photographers or cinematographers, camera phones have also been used successfully by war photographers. The small size of the camera phone allows a war photographer to secretly film the men and women who fight in a war, without them realizing that they have been photographed, thus the camera phone allows the war photographer to document wars while maintaining her or his safety. In 2010, in Ireland the annual "RTÉ 60 second short award" was won by 15-year-old Laura Gaynor, who made her winning cartoon,"Piece of Cake" on her Sony Ericsson C510 camera phone. In 2012, Director/writer Eddie Brown Jr, made the reality thriller Camera Phone which is one of the first commercial produced movies using camera phones as the story's prospective. The film is a reenactment of an actual case and they changed the names to protect those involved. Some modern camera phones (in 2013-2014) have big sensors, thus allowing a street photographer or any other kind of photographer to take photos of similar quality to a semi-pro camera. The cameras of smartphones are used as input devices in numerous research projects and commercial applications. A commercially successful example is the use of QR Codes attached to physical objects. QR Codes can be sensed by the phone using its camera and provide an according link to related digital content, usually a URL. Another approach is using camera images to recognize objects. Content-based image analysis is used to recognize physical objects such as advertisement posters to provide information about the object. Hybrid approaches use a combination of un-obtrusive visual markers and image analysis. An example is to estimate the pose of the camera phone to create a real-time overlay for a 3D paper globe. Some smartphones can provide an augmented reality overlay for 2D objects and to recognize multiple objects on the phone using a stripped down object recognition algorithm as well as using GPS and compass. A few can translate text from a foreign language. Auto-geotagging can show where a picture is taken, promoting interactions and allowing a photo to be mapped with others for comparison. Smartphones can use their front camera (of lesser performance as compared to rear camera) facing the user for purposes like self-portraiture (selfie) and videoconferencing. Camera phones, or more specifically, widespread use of such phones as cameras by the general public, has increased exposure to laws relating to public and private photography. The laws that relate to other types of cameras also apply to camera phones. There are no special laws for camera phones. Enforcing bans on camera phones has proven nearly impossible. They are small and numerous and their use is easy to hide or disguise, making it hard for law enforcement and security personnel to detect or stop use. Total bans on camera phones would also raise questions about freedom of speech and the freedom of the press, since camera phone ban would prevent a citizen or a journalist (or a citizen journalist) from communicating to others a newsworthy event that could be captured with a camera phone. From time to time, organizations and places have prohibited or restricted the use of camera phones and other cameras because of the privacy, security, and copyright issues they pose. Such places include the Pentagon, federal and state courts, museums, schools, theaters, and local fitness clubs. Saudi Arabia, in April 2004, banned the sale of camera phones nationwide for a time before reallowing their sale in December 2004 (although pilgrims on the Hajj were allowed to bring in camera phones). There is the occasional anecdote of camera phones linked to industrial espionage and the activities of paparazzi (which are legal but often controversial), as well as some hacking into wireless operators' network. The 2004 Indian Ocean earthquake was the first global news event where the majority of the first day news footage was no longer provided by professional news crews, but rather by citizen journalists, using primarily camera phones. On November 17, 2006, during a performance at the Laugh Factory comedy club, comedian Michael Richards was recorded responding to hecklers with racial slurs by a member of the audience using a camera phone. The video was widely circulated in television and internet news broadcasts. On December 30, 2006, the execution of former Iraqi dictator Saddam Hussein was recorded by a video camera phone, and made widely available on the Internet. A guard was arrested a few days later. Camera phone video and photographs taken in the immediate aftermath of the 7 July 2005 London bombings were featured worldwide. CNN executive Jonathan Klein predicts camera phone footage will be increasingly used by news organizations. Camera phone digital images helped to spread the 2009 Iranian election protests. Camera phones recorded the BART Police shooting of Oscar Grant. "Storm is coming", an example of iPhoneography. Photography produced specifically with phone cameras has become an art form in its own right. Work in this genre is sometimes referred to as iPhoneography (whether for photographs taken with an iPhone, or any brand of smart phone). The movement, though already a few years old, became mainstream with the advent of the iPhone and its App Store which provided better, easier, and more creative tools for people to shoot, process, and share their work. Reportedly, the first gallery exhibition to feature iPhoneography exclusively opened on June 30, 2010: "Pixels at an Exhibition" was held in Berkeley, California, organized and curated by Knox Bronson and Rae Douglass. Around the same time, the photographer Damon Winter used Hipstamatic to make photos of the war in Afghanistan. A collection of these was published November 21, 2010 in the New York Times in a series titled "A Grunt's Life", earning an international award (3rd) sponsored by RJI, Donald W. Reynolds Journalism Institute. Also in Afghanistan, in 2011, photojournalist David Guttenfelder used an iPhone and the Polarize application. In 2013, National Geographic published a photo feature in which phoneographer Jim Richardson used his iPhone 5s photographerd the Scottish Highlands. ^ "Evolution of the Camera phone: From Sharp J-SH04 to Nokia 808 Pureview". Hoista.net. 2012-02-28. Archived from the original on 2013-07-31. Retrieved 2013-06-21. ^ Johnson, Joel. "Take High-Quality Pics With Your Phone's Low-Quality Camera". Popular Mechanics. Archived from the original on 2010-09-12. ^ "Motorola DROID X vs. HTC Droid Incredible". Phone Arena. Archived from the original on 2011-12-28. ^ Monckton, Paul. "Android 5.0 Camera Tests Show Update Instantly Improves Every Smartphone". Archived from the original on December 18, 2014. Retrieved December 27, 2014. ^ Rehm, Lars. "Panasonic announces Lumix DMC-CM1 smartphone with 1-inch sensor". Archived from the original on December 18, 2014. Retrieved December 27, 2014. ^ a b Parks, Bob (October 2000). "Wired Magazine, The Big Picture - Philippe Kahn". Archived from the original on 2006-03-26. Retrieved 2006-04-20. ^ photobug22 (4 October 2013). "Smartphone Attachable Lens-style Camera - DSCQX100/B Review - Sony US". Sony US. Archived from the original on 4 October 2014. ^ Crisp, Simon (January 18, 2014). "Kodak smart lens cameras try to take on Sony". Archived from the original on October 6, 2014. ^ "NEW ARRIVAL: HTC RE Camera". March 20, 2016. Archived from the original on March 29, 2016. ^ Clark, Don (August 18, 2014). "Add-on thermal imaging". Wall Street Journal. Archived from the original on January 13, 2017. ^ "History of digital camera". 2007-02-19. Archived from the original on February 19, 2007. Retrieved 2016-05-19. ^ "Apple Prototypes: 5 Products We Never Saw". Tech Weird News. 2006-11-30. Archived from the original on 2011-12-10. ^ "United States Patent: D405457 - Digital camera with cellular phone and portable computer". Archived from the original on 2016-10-12. ^ "ZoomInfo Cached Page". zoominfo.com. ^ Maney, Kevin (2007-01-23). "Baby's birth foretells "birth" of the cell phone camera — and societal evolution". USA Today. Archived from the original on 2007-10-21. Retrieved 2007-12-25. ^ Epstein, Sonia (August 2018). "The Birth of the Camera Phone". Retrieved 2018-08-07. ^ Sullivan, Robert (2011). 100 Photographs That Changed The World. LIFE Books. p. 19. ISBN 978-1-60320-176-6. 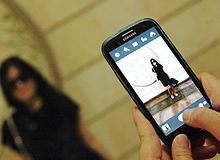 ^ "Strategy Analytics: Camera Phones Outsell Digital Still Cameras Worldwide; NEC, Panasonic and Nokia Lead 25 Million Unit Market". Business Wire. September 25, 2003. Archived from the original on 4 January 2018. Retrieved 17 December 2017. ^ "Dotty but dashing". 8 April 2010. Archived from the original on 5 August 2013 – via The Economist. ^ "Samsung Pixon12 M8910 Price in India - 12 megapixel camera-phone". Newtechnology.co.in. Archived from the original on 2012-04-24. Retrieved 2013-06-21. ^ "Sony Ericsson Satio – A Phone with Ultimate multimedia experience". Newtechnology.co.in. Archived from the original on 2012-07-14. Retrieved 2013-06-21. ^ "The Commuter (2010)". IMDb. 26 October 2010. Archived from the original on 17 November 2010. ^ "Crave". CNET. CBS Interactive. Archived from the original on 2012-04-03. ^ "Asia-Pacific Camera Phone Market Tops 600 Million Units in 2010, Says New Lyra Report". PRWeb. 10 October 2006. Archived from the original on 5 February 2007. ^ Brooke A. Knight, "Performative Pictures: Camera Phones at the Ready," in New Visualities, New Technologies: The New Ecstasy of Communication, ed. J. Macgregor Wise and Hille Koskela (Farnham, Surrey, England: Ashgate, 2012), 162. ^ Kim, Eric. "3 Reasons Why You Should Use the iPhone 5 For Street Photography by Mike Avina". Eric Kim Street Photography Blog. Archived from the original on 2014-03-06. ^ "Textually.org, NY Mayor Bloomberg outlines citizen camphone hotline". January 2007. Archived from the original on 2007-01-27. Retrieved 2007-01-18. ^ Estrin, James (2010-11-21). "Finding the Right Tool to Tell a War Story". The New York Times. Archived from the original on 2014-03-02. ^ LauraGaynorTV (31 March 2010). "Two Tube -Piece of cake - RTE 60 second short award 2010". Archived from the original on 12 October 2016 – via YouTube. ^ "Life after the Leaving: "You have to be a bit of a chancer."". Archived from the original on 2016-04-23. ^ LauraGaynorTV (9 May 2010). "Piece of cake (original mobile version)". Archived from the original on 13 March 2016 – via YouTube. ^ "Eddie Brown Jr". IMDb. Archived from the original on 2012-10-22. ^ "Camera Phone (2012)". IMDb. 29 September 2012. Archived from the original on 19 October 2012. ^ Pielot, M.; Henze, N.; Nickel, C.; Menke, C.; Samadi, S.; Boll, S. (2008). "Evaluation of Camera Phone Based Interaction to Access Information Related to Posters" (PDF). Proceedings of Mobile Interaction with the Real World. Archived from the original (PDF) on 2011-07-19. ^ Schöning, J.; Rohs, M.; Krüger, A (2008). "Mobile Interaction with the "Real World"" (PDF). Proceedings of Mobile Interaction with the Real World. Archived from the original (PDF) on 2011-07-19. ^ Wagner, D.; Reitmayr, G; Mulloni, A; Drummond, T; Schmalstieg, D (2008). "Pose Tracking from Natural Features on Mobile Phones" (PDF). Proceedings of the Symposium on Mixed and Augmented Reality. Archived from the original (PDF) on 2009-06-12. ^ Henze, N.; Schinke, T.; Boll, S. (2009). "What is that? Object recognition from Natural Features on a mobile Phone" (PDF). Proceedings of Mobile Interaction with the Real World. Archived from the original (PDF) on 2011-07-19. ^ "Smartphone app to boost translation". Press Association. Jan 14, 2015. Retrieved 26 January 2015. ^ "Guard at Hanging Blamed for Covert Video of Hussein". washingtonpost.com. Archived from the original on 2008-10-11. ^ Alshawaf, Eman, 'iPhoneography and New Aesthetics: The Emergence of a Social Visual Communication Through Image‐based Social Media' DRS2016: Design + Research + Society, Future-Focused Thinking [2016 Design Research Society 50th Anniversary Conference, 27-30 June 2016, Brighton, UK]. ^ Alshawaf, Eiman, 'iPhoneography and Contemporary Image-Making: Examining a New Form of Visual Communication in the Age of Social Media' (unpublished Ph.D dissertation, University of Minnesota, 2017). ^ Chopra-Gant, Mike, 'Pictures or It Didn’t Happen: Photo-nostalgia, iPhoneography and the Representation of Everyday Life', Photography and Culture, 9.2 (2016), 121-33, doi:10.1080/17514517.2016.1203632. ^ De Panbehchi, Maria Lourdes, 'Nostalgia and iPhone Camera Apps: An Ethnographic Visual Approach to iPhoneography' (unpublished Ph.D. dissertation, Virginia Commonwealth University, 2016). ^ Harrington, Justine, 'Connotations: An Exploration of iPhoneography', Art Journal (2012), 109-13. ^ "Question: What is iPhoneography?". Archived from the original on November 10, 2012. ^ Roberts, Stephanie (2011). The Art of iphoneography. Pixiq. ISBN 978-1600599231. ^ Goldsworthy, Sophie (2011). The Rough Guide to Digital Photography. Rough Guides. p. 187. ISBN 978-1405381178. 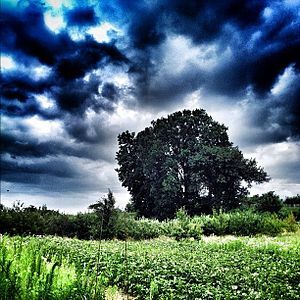 ^ "iPhoneography - How to Create Inspiring Photos with Your Smartphone - Michael Clawson". Apress. 2018-02-05. Retrieved 2019-03-19. ^ Clawson, Michael, iPhoneography: How to Create Inspiring Photos with Your Smartphone (Apress, 2015), , ISBN 978-1-4842-1756-6, doi:10.1007/978-1-4842-1757-3. ^ Roberts, Stephanie, The Art of iPhoneography: A Guide to Mobile Creativity (Brooklyn, NY: Pixel Communications, 2011), ISBN 9781600599231. ^ "How-to: Use the new Camera app in iOS 7". 9to5Mac. 2013-09-20. Retrieved 2019-03-19. ^ Yawnick, Marty. "Review: Pixels at an Exhibition, Giorgi Gallery | Life In LoFi". Life in LoFi: iPhoneography. Retrieved 2016-02-12. ^ Estrin, James (November 21, 2010). "Finding The Right Tool To Tell A War Story". ^ "Hipstamatic War Photography on the Front Page of the New York Times". PetaPixel. 2010-11-23. Retrieved 2019-03-19. ^ Dao, James (21 November 2010). "Between Firefights, Jokes, Sweat and Tedium". New York Times. Retrieved 24 March 2019. ^ "Feature Picture Story". Home Ι Pictures of the Year. Retrieved March 24, 2019. ^ Lavoie, Vincent (2012-05-24). "War and the iPhone". Études photographiques (29). ISSN 1270-9050. ^ "Capturing the Aura of the Scottish Highlands With the iPhone 5s". Photography. 2013-10-07. Retrieved 2019-03-19.